Fishing on Lake Texoma is excellent for striped bass, small mouth bass, and blue catfish. 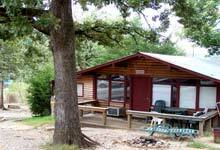 So, if you're headed to Lake Texoma, then plan on making it a weekend and here are some good Lake Texoma fishing cabins. These fishing cabins are the pefect place to cook all the fish you plan to catch and catch a few zzzz's so your ready to go at it again early the next morning. Before you head out, check out the below Lake Texoma Resource Guide to find some fun stuff to do on the lake. Lighthouse offers a variety of different types of cabins plus campsites on the water. You'll find a wide variety of accommodations - from a one bedroom cabin to a 6 bedroom 2 bathroom cabin that sleeps 16. The cabins are clean, equipped with linens and utensils, and most have a full kitchen. Click here to learn more about the cabins. The flood of 2007 destroyed their fishing dock but management is quickly rebuilding a new dock, fish cleaning station, and pavilion for fishing tournaments. Read our review of Lighthouse Resort & Marina. Tanglewood is a fantastic place to spend a weekend or longer fishing, golfing, boating, and having a good time. They are on a bluff above Lake Texoma but it is an easy walk or drive down to Highport Marina which has a ramp, boat rentals, restaurant, bait, and more. Tanglewood has a variety of accommodations including hotel rooms, 1100 to 1500 square foot villas, and a romantic tower suite with a magnificent view of the lake. If you get tired of fishing, then hit the links for 18 holes of great golf. 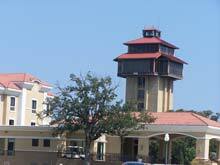 To learn more you should read our review of Tanglewood Resort. Read Texas Outside's Lake Texoma Reveiws to learn more about the lake - what to see and do, where to stay, where to eat, and more.